Tea and Books Saturday #44 - "Tea Time with God"
It was wonderful timing that I happened to rediscover this book just in time for this week's reading. With a magazine deadline just finished, lots of social commitments and an upcoming trip, I felt I was really burning the candle at both ends trying to get everything done. 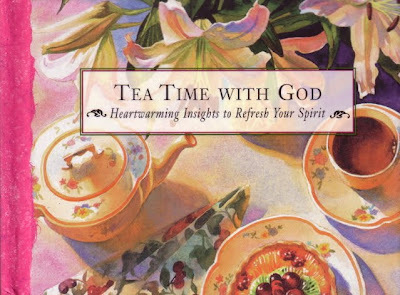 I'm almost there, and what a pleasure it was to enjoy some "Tea Time With God: Heartwarming Insights to Refresh Your Spirit." These devotionals are very short, just a few paragraphs each, yet I was surprised at some of the truths they revealed. Many of the topics dealt with friends, or with slowing down to savor life. My favorite, I think, was the sweet story of a doctoral student who spent a year on a Navajo Indian reservation. She became part of the family and, though the grandmother in the family didn't speak English, she and the student tried to learn phrases in each other's language. When the student's year was up, as she was leaving the grandmother looked her in the eye and said "I like me best when I'm with you." Isn't that lovely? The book goes on to say, "Good friends are the ones around whom we 'like ourselves best' because they have a way of bringing out the best in us. Jesus is that kind of Friend to us." I so agree! 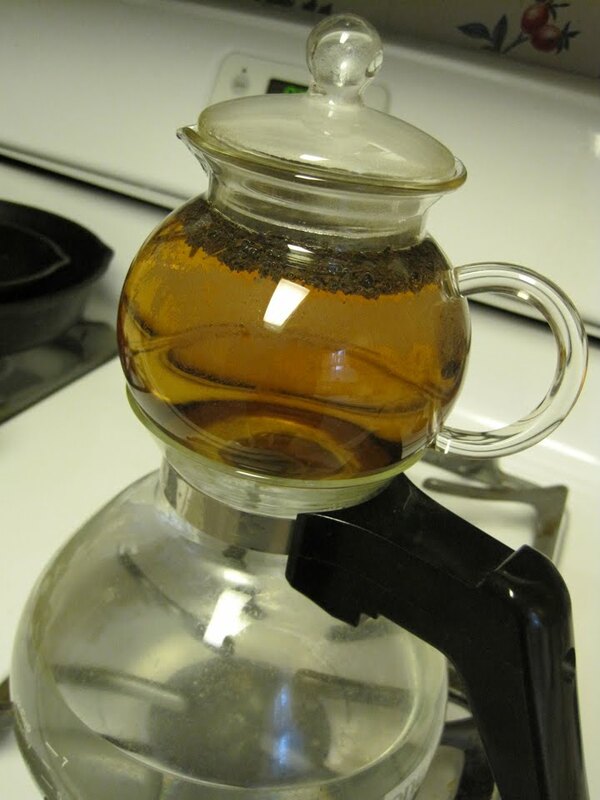 Several of the devotionals concerned ways those of us in an office environment can take a mental break or "tea break" during the afternoon to help us wind down from a stressful day. Some of the titles are "Halt!," "Downshifting" and "The 'Off' Switch," just to give you an idea of what's in store. This book was a gift from a friend many years ago, and I'm sorry I didn't take advantage of its advice before now! Some sad news arrived by e-mail recently: Collector Books is closing its book division after 40 years. I was so sorry to hear that, because I've been a great fan of their collectibles books, including the "Collectible Cups and Saucers" series of price guides, which I know some of you have as well. 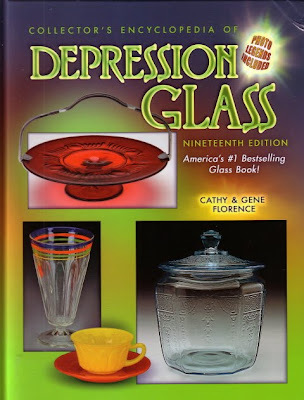 The news was especially surprising since the company had just recently sent me a review copy of its 19th (and final) edition of the "Collector's Encyclopedia of Depression Glass" by Cathy and Gene Florence. This book has been a tremendous help to me since I've started collecting Tea Room pattern Depression Glass -- and a few other assorted pink patterns. 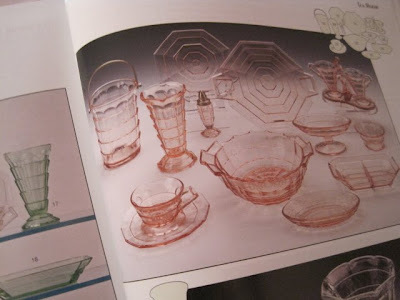 This book has three pages of Tea Room glass prices and photos, and here's a detail from one page. I would *love* to find a cup and saucer like the one in the foreground at lower left. (Actually, I'd love one or two of everything listed in the pattern, but I would most enjoy finding a cup and saucer!) 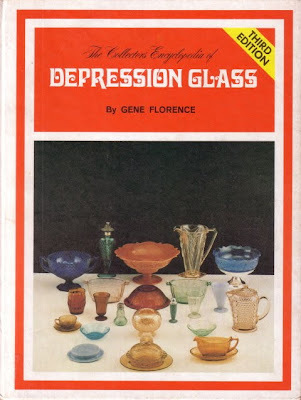 If you want to research your Depression Glass, this is THE book to have. Recalling that my mother had a guidebook when she started collecting Depression Glass years ago, I searched online until I found the exact edition she had, and bought a copy for 75 cents. It was the third edition of this very same guide by the Florences, it turns out. I well remembered that red cover and the 1970s looking font. I can't believe I remembered some of the stories from the book after all this time. And I enjoyed remembering that when my mother collected "Iris and Herringbone" pattern dishes, my little sister called the pattern "Irish Hambone." Collector Books says it is closing its book division because it can't compete with all the free information now available on the internet, and I do understand that, but as a book lover and a collectibles lover, I'm certainly sorry to see them go! 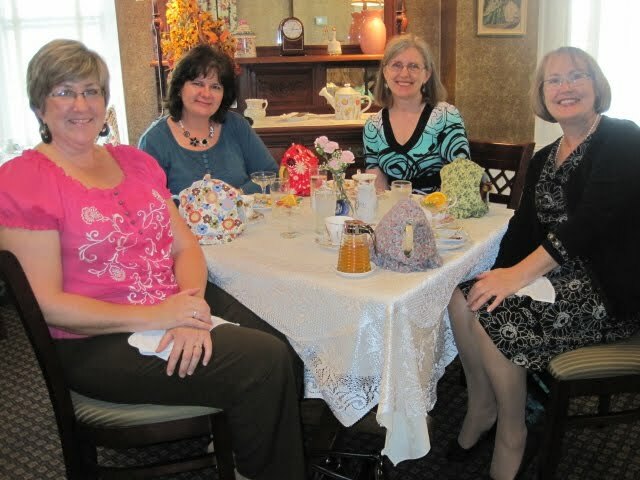 It was a dark and stormy afternoon in much of Georgia yesterday, but I had a good time anyway participating in the first Teacup Exchange at Newnan's beloved Holly Cottage Tearoom! Ironically enough, I had made a solo reservation for myself but soon found out my friend Teresa had signed up for the same time. Then, I found out my friend and co-worker Deberah wanted to go, and by the time I got an e-mail from Maureen asking if I had plans to attend, I realized we had a great foursome in the works. All of us are bloggers (that's actually how I first met Maureen and Teresa), so from left we have Teresa of Southern Touch Catering, me, Maureen of Tea and Talk, and Deberah of Everyday Finesse. 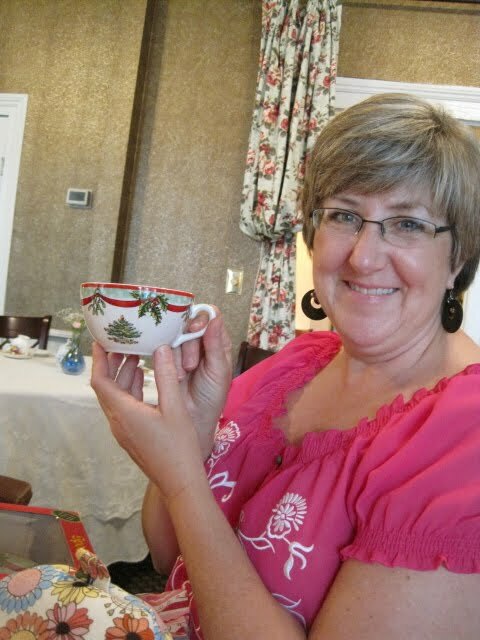 The Teacup Exchange was a fun idea in and of itself, but I especially liked that half the proceeds would be going to a local ministry I support, Coweta Pregnancy Services. CPS not only helps women in crisis pregnancies, which is great, but it also provides lots of support to women *after* the baby is born, meeting needs of every kind. I think that is an important part of these ministries, so I was thrilled to hear my favorite tearoom was having a benefit for a favorite ministry! 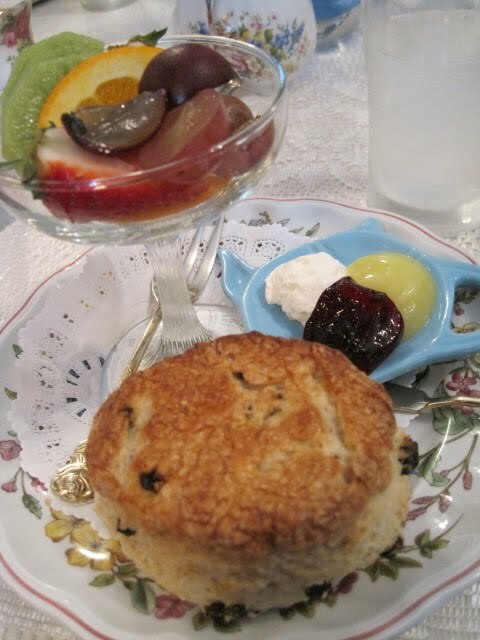 For $9.95, we got a pot of tea of our choice, the tearoom's famous Yorkshire Loaf (already eaten by photo time, sorry), a scone with lemon curd, preserves and clotted cream, and a fresh fruit cup. So what teacups did we all end up with? Well, Teresa got an oversized Christmas cup and saucer from Spode. 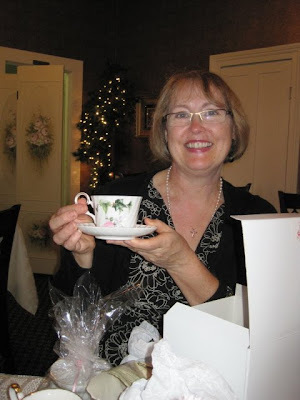 Maureen got a Johnson Brothers Old Britain Castles cup and saucer. Deberah got a set with pink roses and ivy. 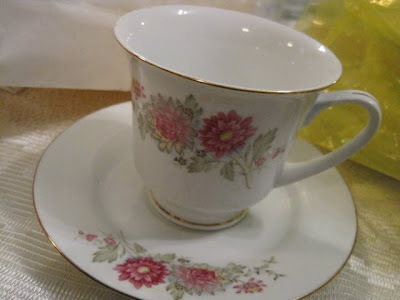 And I am always happy when I receive a cup and saucer with pink flowers -- especially if it's a design I've never had before, and this one was. So the rain and storms may have swirled outside, but I can certainly report that hearts were happy inside! A Turkish Tea Ceremony & my new Turkish tea friend! Today I have the distinct pleasure of introducing my delightful new tea friend Karin, who lives in Istanbul, Turkey. 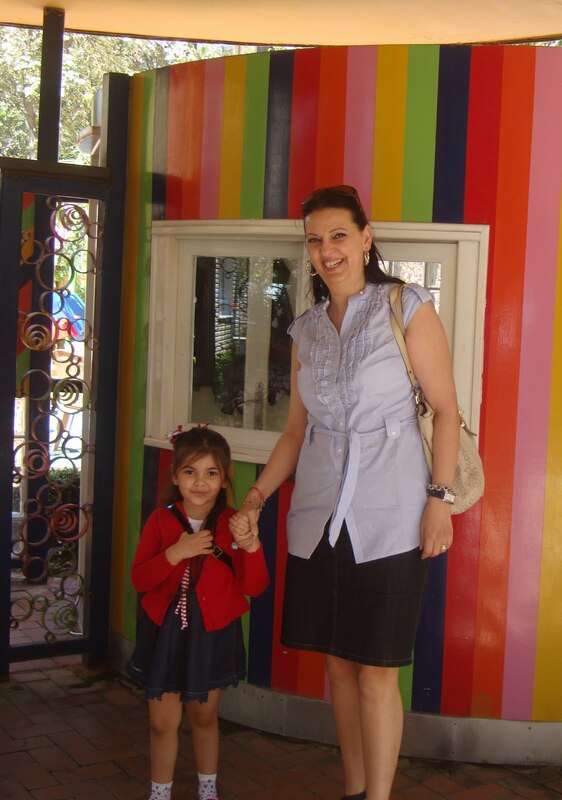 Here she is shown with her adorable daughter Talya, who is 4 and just started school. Karin discovered my blog some weeks ago, sent me an incredibly kind e-mail, and we have been corresponding ever since. It has been so much fun getting to know a fellow tea lover in Turkey and learning about the tea customs there. Although she is from Istanbul, Karin actually grew up in California before she returned to Istanbul and, as she put it, "got married to a Turkish boy" (he's cute, too!). After college she worked in the professional world before becoming a full-time mom. So it's no surprise her English is terrific, which is a good thing since I can speak only one word in the Turkish language. 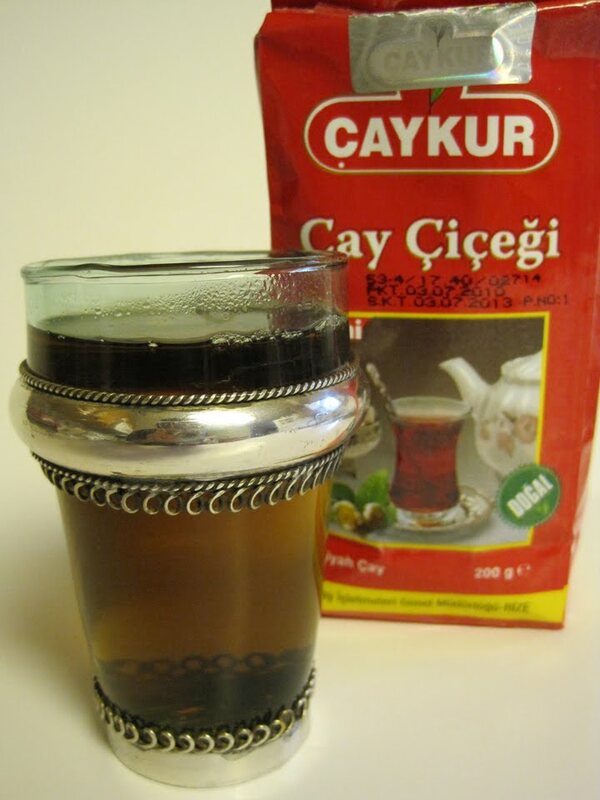 Through a little research, I learned that "çay" is the word for tea, and it is pronounced like our word "chai." 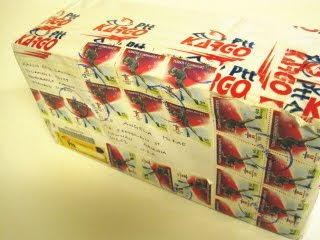 I even loved seeing the Turkish stamps on the package, and of course I have saved them for some future craft project. 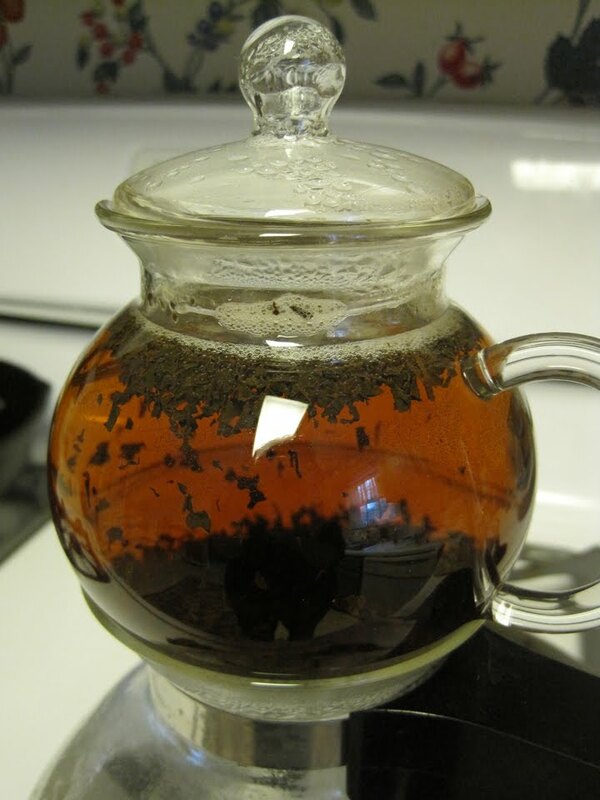 Karin had already e-mailed me the directions for making Turkish tea, and I was eager to try it because the preparation method she described is so unlike how we make tea here in the U.S. I adapted her directions a bit to use with the equipment I had on hand, and I took photos so you could see my Turkish Tea Ceremony. First, I opened the package of "çay" to study the tea's appearance and scent. It had a wonderfully fresh, woody fragrance, and the pieces of leaf were very dark brown with a few auburn colored bits throughout. 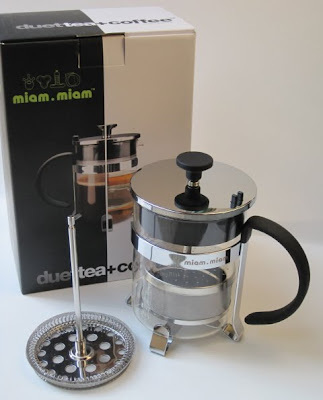 In Turkey they use special stacking tea kettles similar to this camp-style tea kettle I once borrowed from a friend. 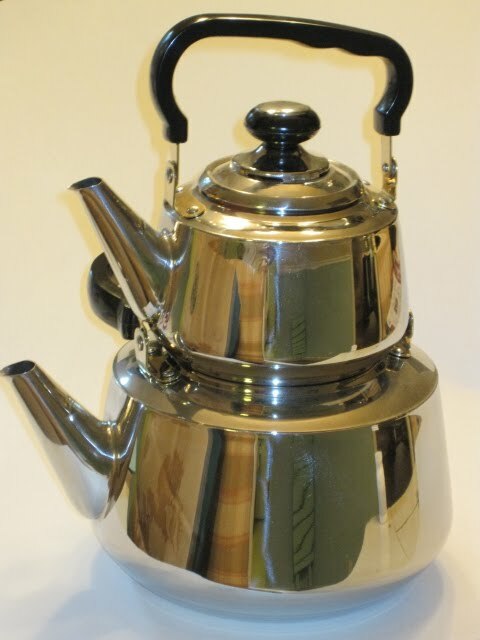 So instead, Karin said that I could use a large metal tea kettle and a small metal or ceramic teapot. 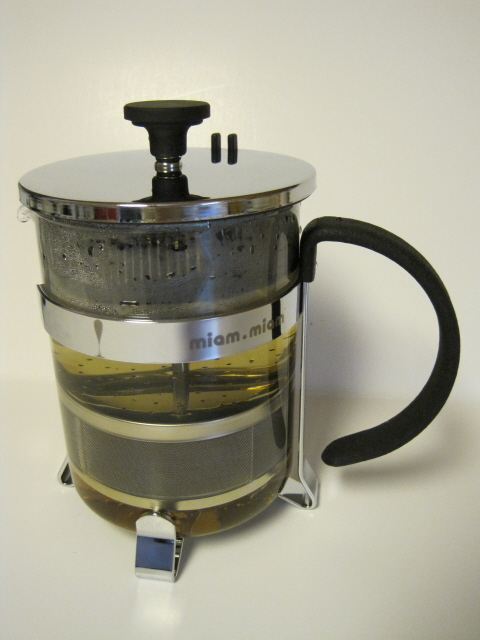 Since I don't currently have a metal one I used my stovetop glass tea kettle, removed the lid, then placed a small glass teapot (and lid) on top. She said to use 1-1/2 teaspoons of tea leaves per person and one cube of sugar (I just used a teaspoon of sugar instead). Brewing the tea with the sugar "makes the flavours play happily inside the tea ... while the water is boiling underneath. 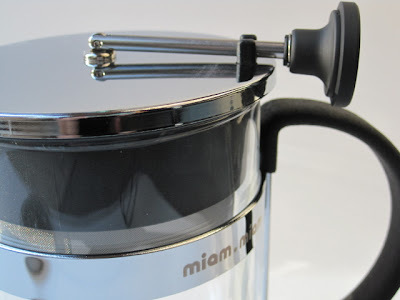 Do not add water to the small kettle." OK. I did that, as she suggested, until I could hear the water beginning to boil. Once the water is boiling, you reduce the heat to low, add 1 cup of the boiling water per teaspoon of tea to the small kettle (or teapot, in this case) on top. Then you add fresh water to the large kettle and again place the small kettle (or teapot) on top, covered with the lid. So in this photo I have just added boiling water from the kettle to the glass teapot on top, added fresh water to the large kettle and returned it to the stove. I sort of jiggled the teapot a bit and they started falling. After about 5 minutes, the tea leaves had sunk. 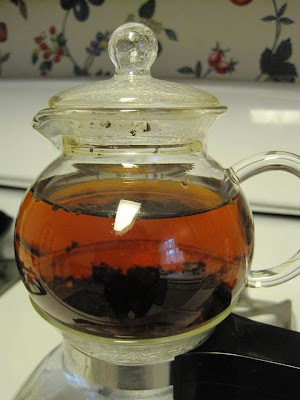 I was intrigued by Karin's description of the tea's color: "The tea should be bright red. The Turkish people call it rabbit blood color, so I prefer to say bright red!" I agree with Karin on that! After reading the book about two tea-loving women from Rome, Ga. last week, I thought it was rather ironic that my mom wanted to go antiquing in Rome on Saturday. 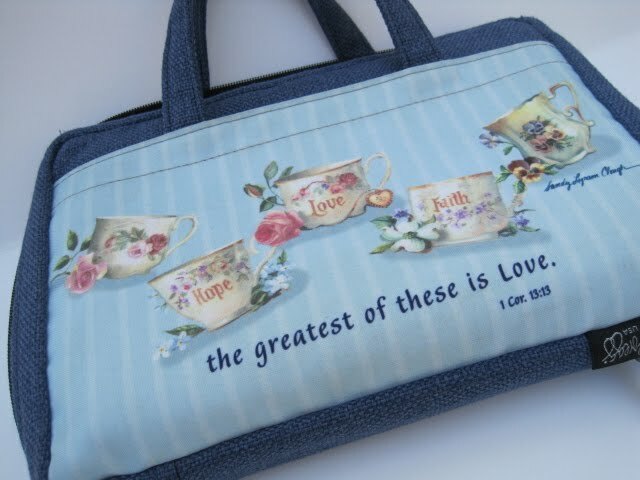 But I enjoy visiting the antique malls and shops in the Rome area, and in one of them I came across an item I have actually been needing, a new Bible cover. I have never seen one with teacups on it before, so I was tickled to find this one with teacups by Sandy Lynam Clough. And for just $4, too! 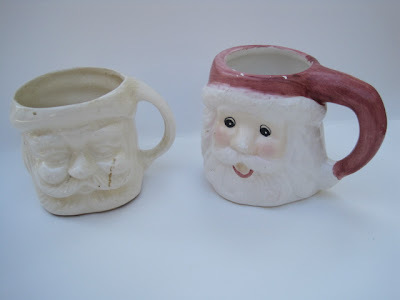 We also came across a yard sale with a solid white Santa mug (which needs cleaning) for a quarter. The other one was a piece my mom had already picked up for me elsewhere, so it was free (to me). 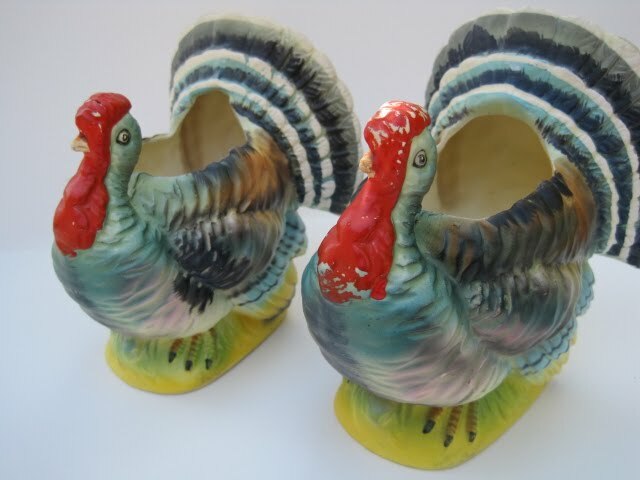 Oddly, very oddly, my favorite find of the weekend was this pair of vintage turkey planters. I don't guess I'd ever thought about vintage decor for *Thanksgiving* so I was delighted to find these. Love them and can't even explain why. It was $6.50 for the pair, which I thought was a good price. So when in Rome, I did as the Romans do: I shopped! 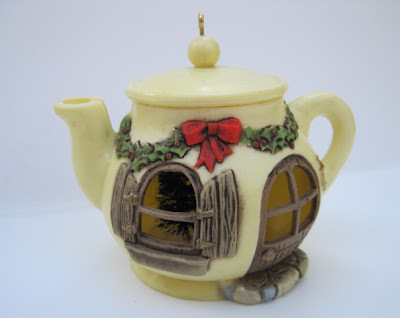 After a thoughtful alert from my tea friend in cyberspace, Gerri, I was hoping to be in the neighborhood of a Kmart, which my town no longer has, so I could find some of Country Living's new teapot ornaments. I happened to pass right by the one in Rome, Ga. over the weekend, and voila, there they are! I think this may be my favorite of the ornaments I bought. 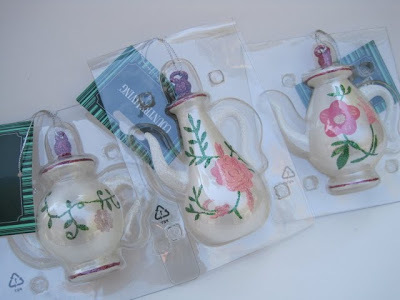 Kmart really has some lovely ornaments this year, and these are the three teapot designs I found. I'm sorry to have to tell you I paid full retail price ($4.99 each), since these weren't on sale, but sometimes a girl's gotta do what a girl's gotta do. One thing that made me even happier about these lovely ornaments? 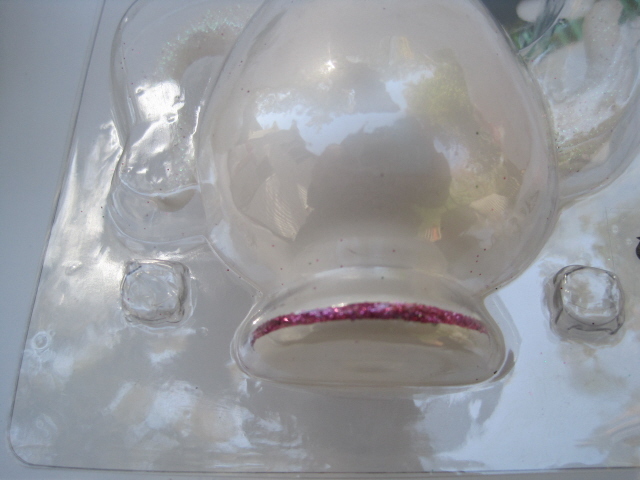 The packaging has those "bubble" type closures, so you can re-use the packaging for storage! Nice! 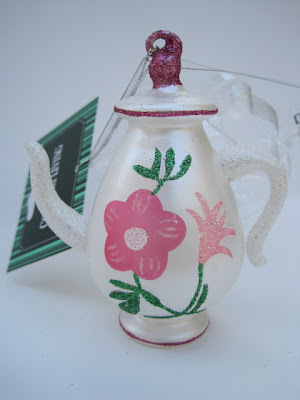 I also found a vintage Hallmark teapot ornament (if 1980 counts as "vintage") for just $3 at an antique mall. 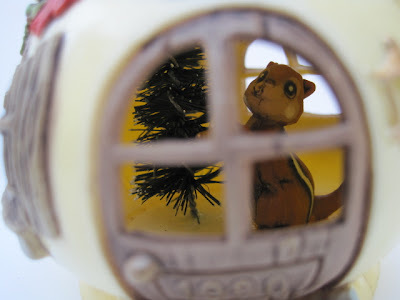 On the interior is a little chipmunk decorating a tiny bottlebrush tree. So thanks to Gerri and the antique mall, it was a great weekend for finding teapot ornaments! Tea and Books Saturday #43: "Tea with Sister Anna"
Several weeks ago, my friend and co-worker Jeff arrived at the office and handed me a book he and his wife Barbara had come across while sorting through their stacks. They knew immediately it was something I should read, and I can't tell you how happy I am to have been introduced to "Tea with Sister Anna: A Paris Journal" by Susan Gilbert Harvey. The author is a visual and performance artist in Rome, Ga., where Jeff once worked. While tea plays more of a supporting role in this book than it does in those I usually read for review, in which tea is the star, it is nonetheless an important "character" in the book and the title is quite fitting. You see, in the late 1800s Harvey's great-aunt, Anna McNulty Lester, left her small town of Rome in north Georgia to travel overseas and study art in Paris. A hundred years later her great-niece, the delightful Susan Harvey, feels something of a spiritual nudge and decides to retrace her great-aunt's path. 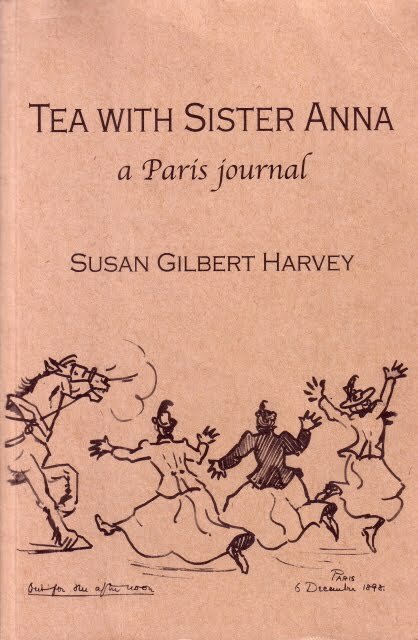 Guided by her aunt's guidebooks, journal entries and letters — along with her own apparently unerring sixth sense — Harvey explores what she calls "Anna Lester's Paris." It is by no means a first trip to the city for Harvey. In 1957, she was a student at Hollins College in Virginia and spent a year in the Hollins Abroad-Paris program. 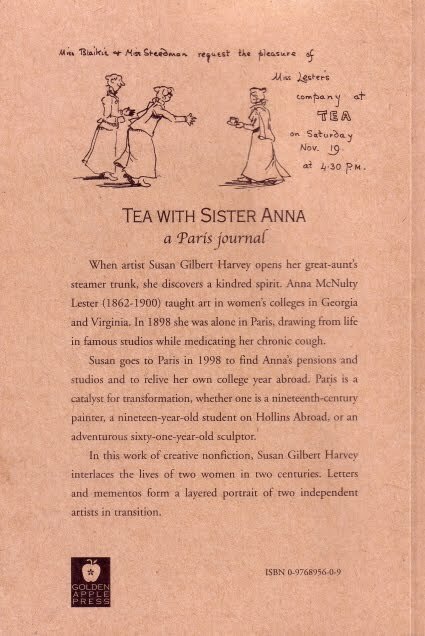 In "Tea with Sister Anna," she somehow manages to weave a seamless tale which includes her writings from that 40-years-ago trip and the current one along with her great-aunt's writings from 1897 and 1898. It is fascinating to watch the 60-something Harvey revisit her 20-year-old self as well as the great-aunt she never had the pleasure of knowing. 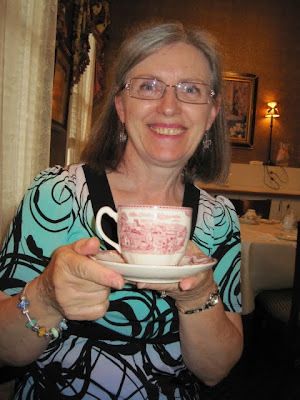 I was reminded a great deal of the wonderful series of blog posts on "Strong Women" recently concluded by the writer and tea blogger Marilyn Miller. Certainly Harvey and Lester qualify for that group! But perhaps I care too much about this story because I, too, am often afflicted with wanderlust — plus as a lifelong Georgia girl I have the good fortune of being pretty well acquainted with Anna Lester's hometown. 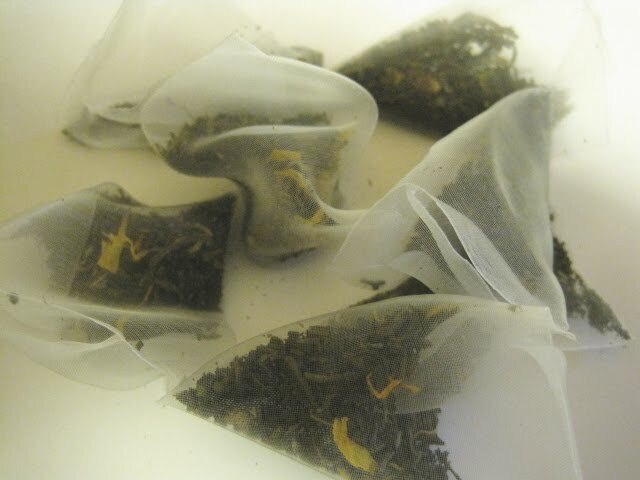 So would you like some tea tidbits? How about this passage where Harvey is still in the early stages of planning her trip: "On Aunt Joy's Chinese lacquer tea table I place one of Anna's miniature portraits, her plaster cast of clasped hands, the edelweiss she and Granny picked in Zermatt, and the last coral geranium from my porch. Anna's blue-and-white Paris teapot comes off the shelf of my grandmother's secretary. I splash copper-colored tea into two porcelain cups — one for me, one for Sister Anna. I add lump sugar and lemon, and stir with my great-great-grandmother's spoon …"
Anna is focused on learning to draw the human figure while in Paris, and naturally she also visits the great museums and writes of art and artists. But tea and the foods she ate (or didn't eat) are often mentioned, and often humorously. Early in her travels, Anna wrote to her parents of how she was appalled to learn boarders such as herself were being asked to furnish their own sugar for their tea. "I do have sugar in my room but they shall not see it! And I gave the maid a cup and expect to have tea when I like. I call them stingy old maids. 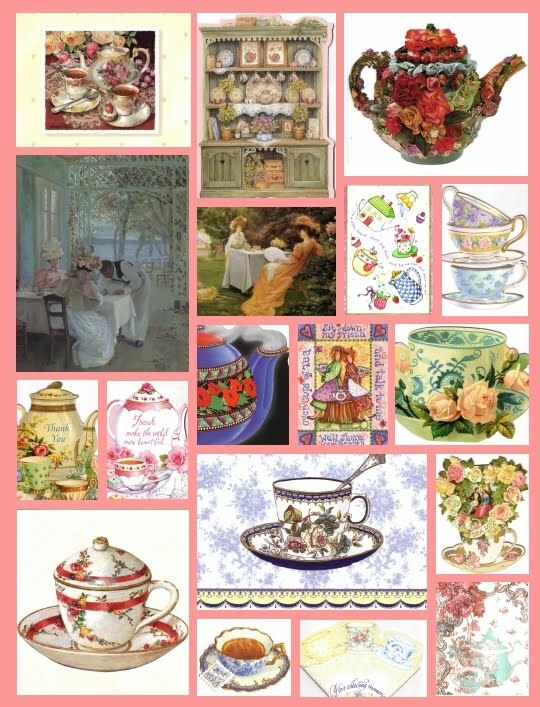 I am an old maid but if I had boarders they should have good sugar and plenty of it too!" Did you note the clever cartoonlike drawings which appear on the front and back cover of the book? Be sure and check out the back cover, especially, by double-clicking if you have a moment. These drawings are by a Scottish woman who was at one time a neighbor of Anna during her stay in Paris. Though Anna never got to achieve artistic success since she died so young, of tuberculosis, her joie de vivre in her too-short years comes shining through in this well-written and charming book. You can't help having the distinct feeling she would be so pleased her great-niece found her life worthy of this tribute. Interested? Learn more about Harvey, her art and her Sister Anna book here. Often I marvel that Whole Foods hasn't already built a store on the south side of Atlanta. So many of my friends make a special trip to Atlanta to go to one, and I do too, periodically. Last weekend, it was actually my husband's idea to make a stop at Whole Foods. He was searching for some good coffee to have coarsely ground to try in that new French press I wrote about earlier in the week. I, of course, had to scan the tea aisle, and I came home with this Caramelized Pear Biodynamic Green Tea from Zhena's Gypsy Tea. 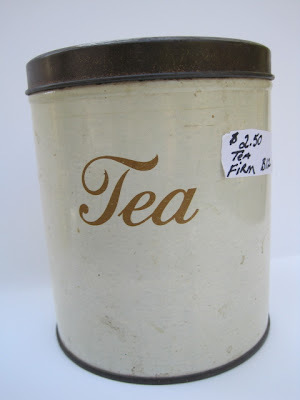 This tea comes in a tin of 15 "couture tea sachets," those nice silky teabags that are so popular these days. Do you like pears? 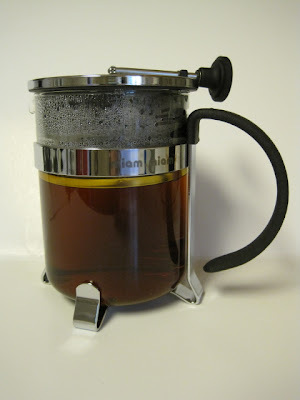 I do, and the idea of combining caramel and pear flavors in a tea greatly appealed to me. So how was it? 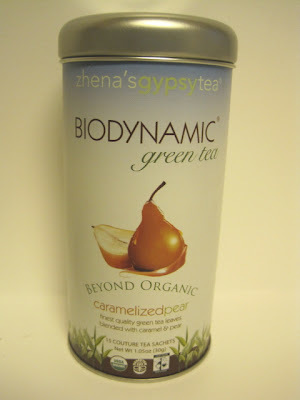 I was very, very pleased that the rich sweetness of pears came through in this tea's delicious taste, so next time you're at Whole Foods you may want to pick up a tin! Over the weekend I was searching for some old photos and ended up going through a lot of old cards and letters as well. Long about the mid to late 1990s, a theme began to emerge in the correspondence I received! I think these pieces are so beautiful, and if you double-click on the image I bet you'll come across some cards you've received or sent yourself. I have a question, though. Do you have any creative ways of displaying your cards? Mine are currently housed in hatboxes, but rediscovering them this weekend made me want to do something a bit more visible with them. Any ideas, friends? It's always fun to try teas from a new tea company, so I was quite happy when a package arrived from the East Pacific Tea Co. a few days ago. This firm is one I'd not heard of, but I certainly plan to be a customer now. And happily, their website says they have free shipping this fall! Hurrah! 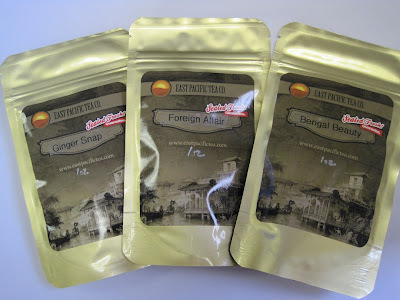 So here are some mini-reviews of the first three of the teas I tried. 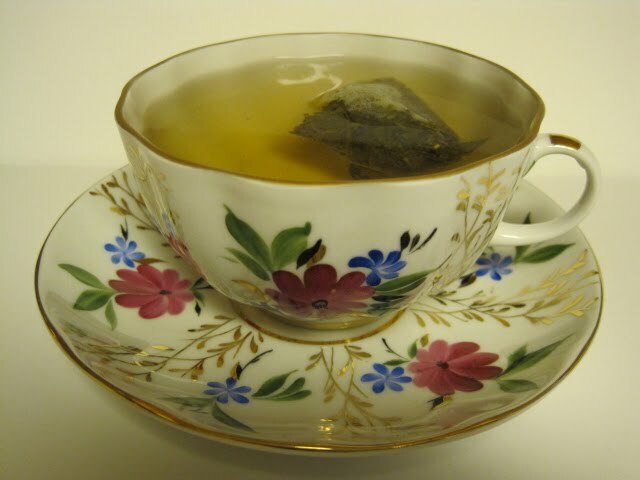 First I had their Foreign Affair blend, a rooibos tea which "features buds from flowers of the Provence region in France. 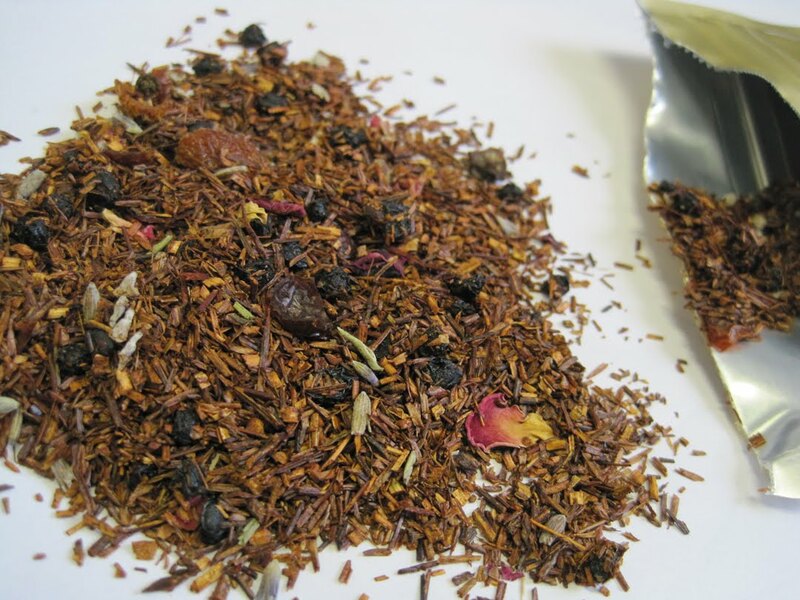 This rooibos tea is the most deliciously aromatic combination currently offered." Rooibos tea is such a pretty tea, and this one had a combination of elements that was pleasing to both the eye and the palate. Flavored rooibos teas such as this one are good as dessert teas, and Foreign Affair had a wonderfully sweet and complex flavor. A very, very enjoyable rooibos! 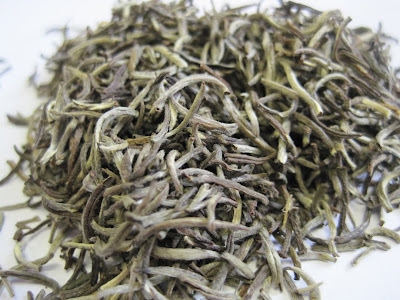 Next I tried Bengal Beauty, a fluffy looking white Darjeeling said to hail "from the rich soils of the Indian mountains. 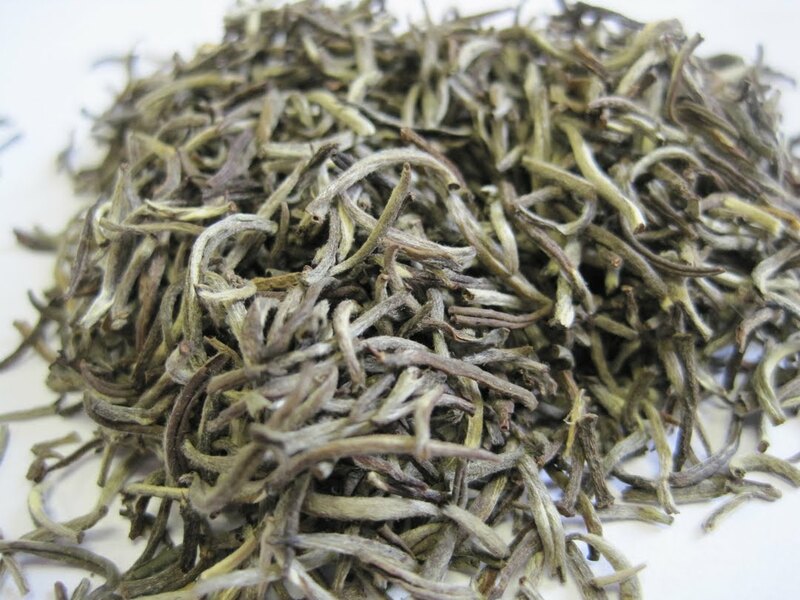 The subtle taste and delicate scent of this rare tea makes it one of India’s best kept secrets." Thank goodness I got over my initial shock at learning there was such a thing as a green Darjeeling a while back or else I'd have really been shocked by the very idea of a white Darjeeling! 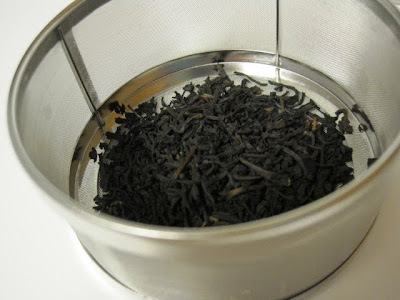 This one surprised me with the depth and richness of its flavor, and it had that "brothy" texture I've come to enjoy in good teas. Very much enjoyed the Bengal Beauty (and I like the name, too!). Ginger Snap Puerh? Why not! 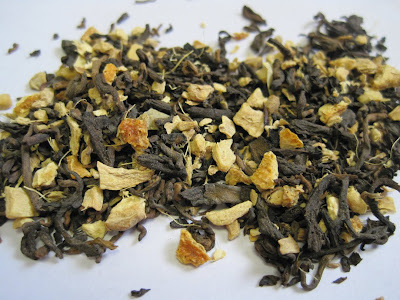 This one is billed as having "a nice strong taste … complimented by the addition of ginger root and orange peel in this deliciously spicy organic tea blend." 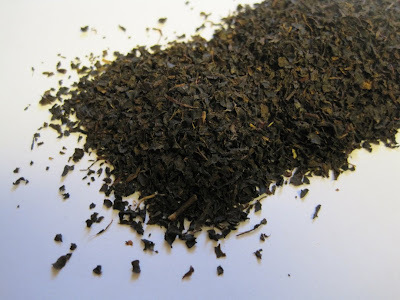 Surely this is the puerh that will convince those who think they don't like puerh tea to give it a try! A very delicious blend, and my fall allergies are also grateful for that zip from the ginger in this one. Yum! So thanks for the samples, East Pacific Tea Co. You've got me hooked! 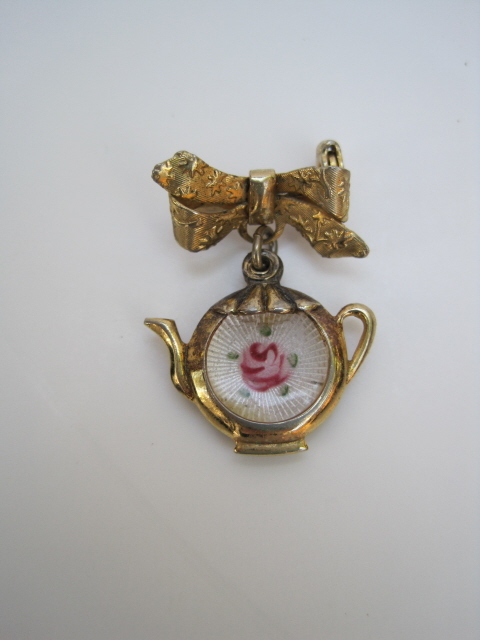 My newest piece of tea-themed jewelry is this tiny, one-inch-tall vintage bow pin with a teapot charm featuring a white enamel design with a pink rose. This petite piece will have to find just the right perch, such as a blouse or coat collar or perhaps a turtleneck sweater when it turns cool enough. A while back I found a similar rose-on-enamel design locket and gave it to the friend it immediately reminded me of. I had never thought to look for a similar tea-themed piece for myself until I happened upon this one! 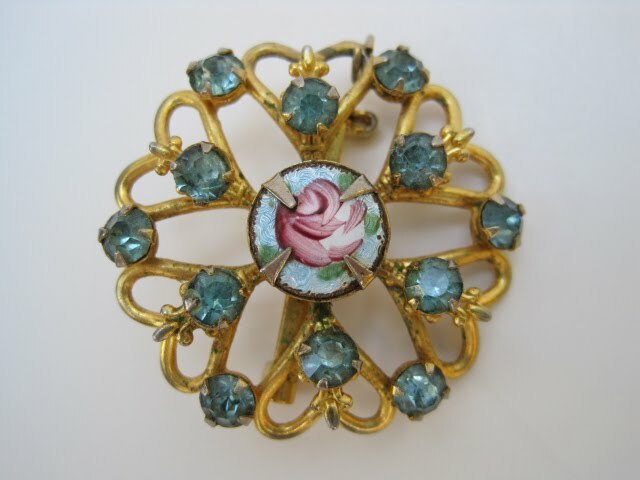 Last Christmas, a girlfriend gave me this beautiful vintage pin featuring a robin's egg blue enamel design and a similar rose. I love the design and the pretty rose, and these pieces somehow remind me of grown-up versions of the jewelry I wore as a little girl. 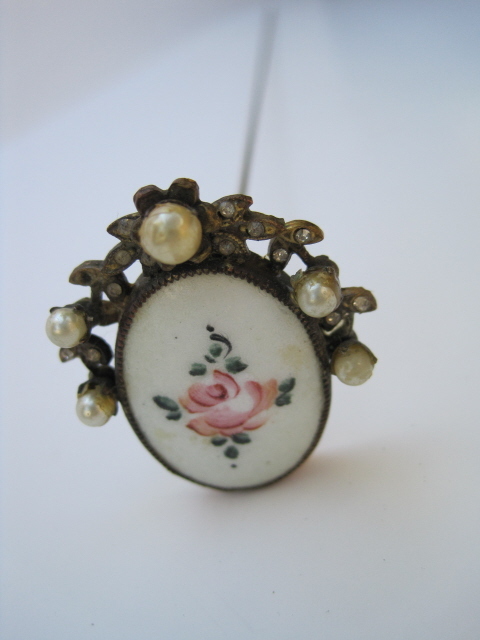 And so it was a lovely surprise when another friend gifted me with this vintage hatpin last week. She had purchased a collection of old hatpins at an estate sale and told me to select my favorite one. Isn't this piece just exquisite? I can just picture it adorning some wide-brimmed, rose-strewn hat of yesteryear, perhaps one worn to teatime! Since they say three of anything constitutes a collection, I guess I'm a collector of these pieces now. Purely by accident, but it was a happy accident! A French press and tea infuser -- that works! 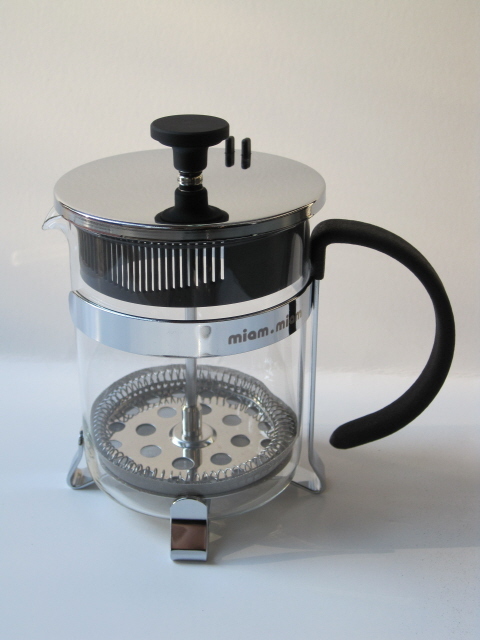 Recently I received an e-mail press release promoting Miam Miam's new Duet French press, which the company was calling the world's first hybrid French press and tea infuser. "Sure," I thought, completely skeptical. "Like that could ever work." 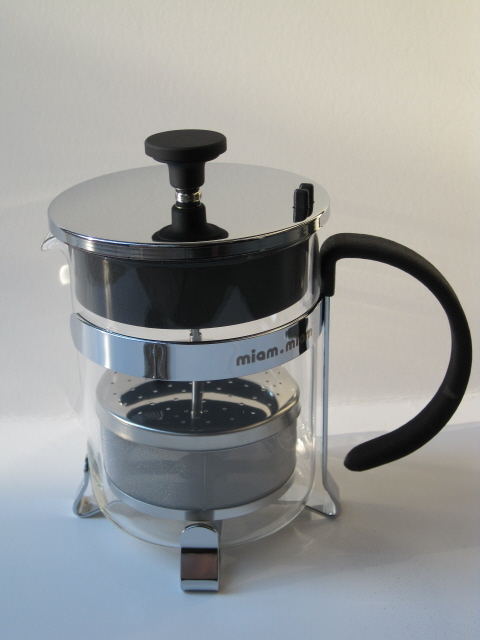 The press release mentioned samples were available, but I've tried several French presses that supposedly brewed tea, always disappointed when tea leaves ended up in my brew, and so I didn't want to waste time trying another one, even if it didn't cost me anything. About two days later, my coffee-drinking husband, who had never expressed an interest in a French press before, told me he was researching these gadgets online. "Wait!" I said. "I'll get us one that's a hybrid!" ... and one for tea. 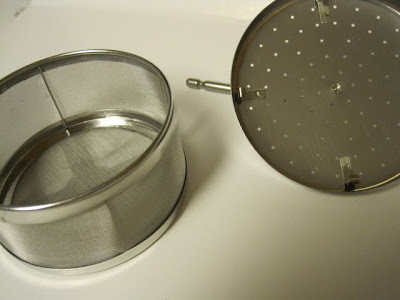 The one for tea includes a fine mesh infuser basket. And the tea rod has a hinge that allows it to lock into place out of the way of the water once the tea is finished steeping. Looks like someone in the design world is a tea lover after all. Hmmm. Now things were starting to get interesting! The top removed easily, and I began to get my hopes up that this Duet just might work! 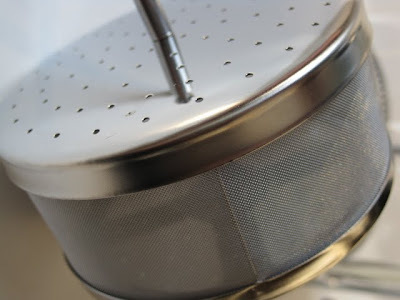 I measured out some Florence tea from Harney and Sons and placed it in the basket while the tea kettle boiled. 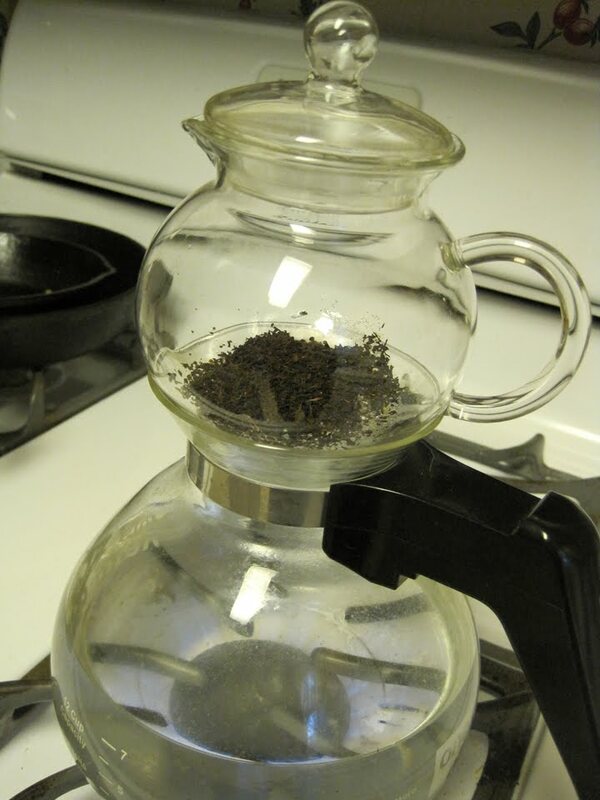 Soon, I was pouring water into the French press. Here, the floating basket is doing its thing. I love that the tea leaves have lots of room to expand and develop their flavor. Ever heard of Guayusa tea? Tea and Books Saturday #40 - "The Book of Tea"